Vancouver, Canada, September 10, 2018, Owners of legendary Carl Zeiss optics in Contax N-Mount have long demanded a trusted migration path to mirrorless cameras. 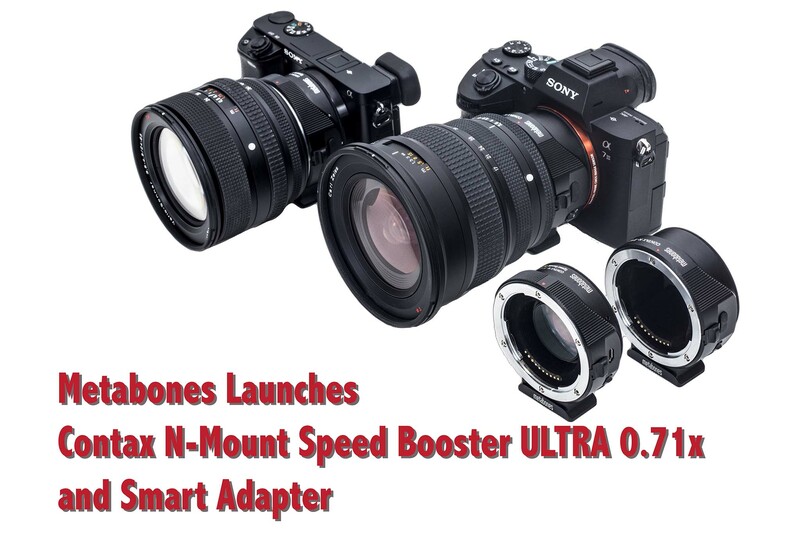 With the advent of Metabones® Contax N-Mount to Sony E-Mount Speed Booster® ULTRA and Contax N-Mount to Sony E-Mount Smart Adapter, the longing is over. Get a glimpse of the ergonomic experience of the original Contax N1 camera by using the lens’ own aperture ring in aperture priority and manual exposure modes on A9, A7 series, A6500 and A6300. Fully automatic exposure and shutter priority are also available. A customizable button on the adapter can be assigned to more than 50 different functions on an A9, A7 series, A6500 or A6300 camera, including depth-of-field preview. Putting that button on the hand-grip side would have matched a genuine Contax N camera, but since that would have been next to Sony’s lens release button, we opted to place this customizable button on the other side of the adapter instead, right where the thumb of your left hand is. The workmanship and attention to detail are evident from the signature Metabones design and the two electrical contacts carrying power, which are thicker in the same way as a genuine Contax N series autofocus camera. The inside of the adapter is flocked with felt to minimize internal reflection. A tripod foot compatible with the Arca-Swiss style quick release is included. Metabones has a proven track record of firmware stability and timely firmware support. Firmware is user-upgradable via the adapter’s micro USB port. Contax made history by offering the world’s first full-frame digital camera, Contax N-Digital, in 2002. All Contax products had been discontinued by 2005, leaving some of the finest autofocus optics ever made in search of a successor. None of these lenses feature optical image stabilization, and this is where the 5-axis in-body image stabilization (SteadyShot INSIDE) of Sony A9, A7 Mark III series, A7 Mark II series and A6500 comes in as a much-needed complement. The heritage lives on, with the very same Carl Zeiss lenses from the dawn of full-frame digital photography now leveraging the latest and greatest mirrorless camera features and poised to benefit from further technological advances in the future. Metabones® Contax N-Mount to Sony E-Mount Smart Adapter and Contax N-Mount to Sony E-Mount Speed Booster ULTRA are available right now for USD 399 and USD 649 respectively, plus applicable tax(es), duties and shipping, from Metabones’ web store and its worldwide network of resellers. Enable full 5-axis in-body image stabilization of the A9, A7 Mark III series, A7 Mark II series and A6500. This entry was posted in 3rd Party Lens, Accessories and tagged 4/50, 4/85, 5-4, 5/70-200, 8/140, Apo-Makro-Planar T* 4/120, Apo-Teletessar T* 4/350, Apo-Teletessar T* 4/400, Contax, Distagon T* 2.8/45, Distagon T* 3.5/35, Distagon T* 3.5/55, Makro-Sonnar T* 2.8/100, Metabones, Metabones Contax N-Mount Smart Adapter, Metabones Contax N-Mount Speed Booster ULTRA Smart Adapter, Mutar 1.4x T*, Planar T* 1, Planar T* 2/80, Sonnar T* 2, Sonnar T* 4/210, Vario-Sonnar T* 2.8/17-35, Vario-Sonnar T* 3, Vario-Sonnar T* 3.5-4.5/24-85, Vario-Sonnar T* 3.5-5.6/28-80, Vario-Sonnar T* 4-5.6/70-300, Vario-Sonnar T* 4.5/45-90. Bookmark the permalink. Trackbacks are closed, but you can post a comment.